The Assorted Fish Chirashi (S$16.80) is one delight you must order. 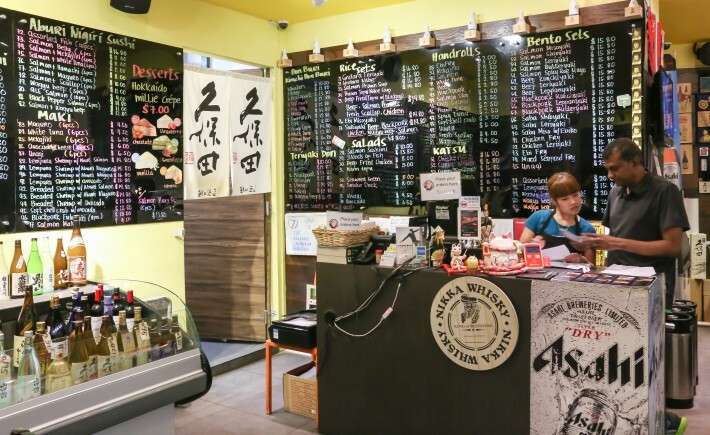 This don comes with 4 different types of premium sashimi; salmon, tuna and swordfish are staples whereas the fourth sashimi is on rotation subject to the available fish of the day. Although some may find comfort in consistency, a little surprise and unpredictability at meal time is always welcomed. 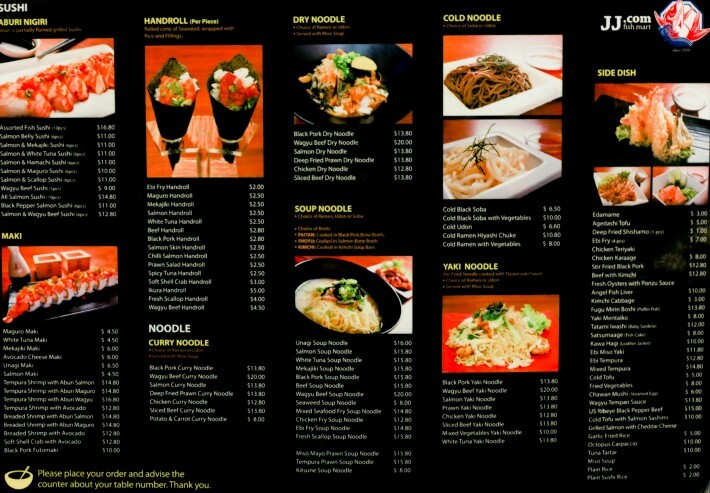 Do not be deceived by the small bowl. Our don came with 2 to 3 thick, juicy slices per type of sashimi, a generous helping of fish roe, a few slices of cucumber atop sweet sushi rice. 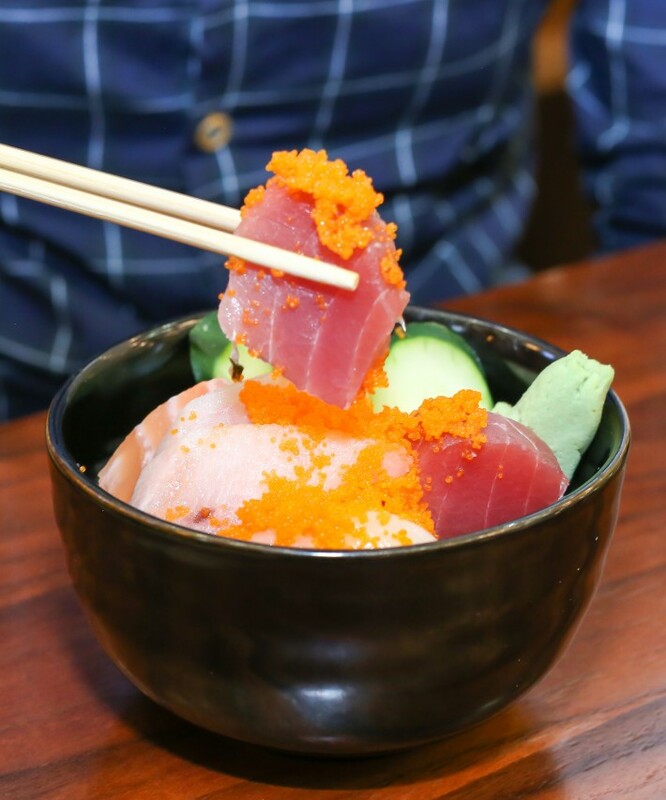 Although not the most affordable choice for an everyday meal, it is one we would splurge on again as the Assorted Fish Chirashi was worth every penny. JJ.Com Fish Mart’s Tempura Shrimp with Aburi Salmon Maki (S$14.80) was the proud recipient of the SR Signatures award in 2016. This was unsurprising as the presentation and taste of the maki was nothing short of fantastic. 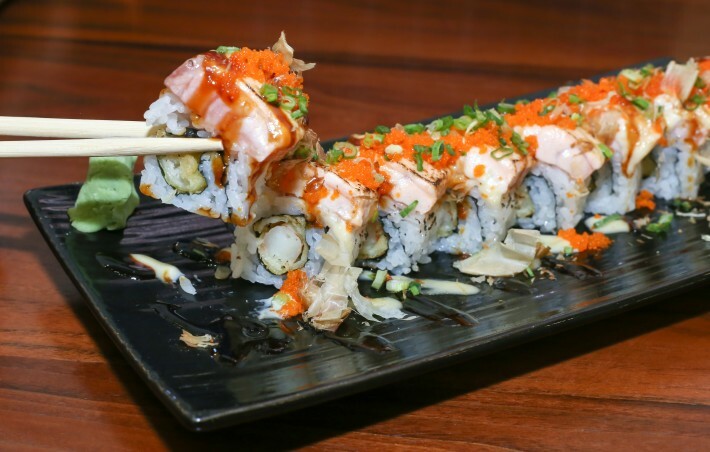 A thick slab of smokey melt-in-your-mouth aburi salmon is layered precisely atop the rice filled with crispy and sweet tempura shrimp. Finally, the maki is topped off with Bonito flakes and Japanese mayonnaise drizzled all over the plate. 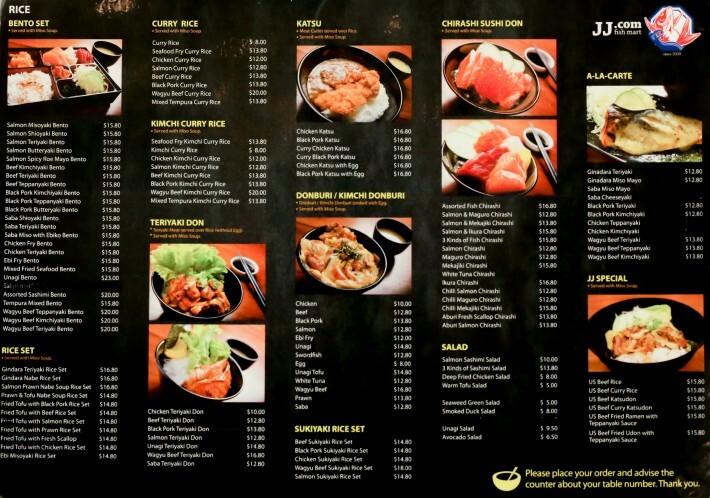 Overall, we can certainly say that JJ.Com Fish Mart is one Japanese eatery that we will be adding to our list of favourite casual Japanese eateries and it is definitely one worth the visit. A member of the team at ladyironchef, Claire’s mission is to lead a life without regrets—to explore the world and its treasures boldly. When she isn’t pursuing her interests in writing, academia and music, Claire spends her free time with family and her pets. She also hopes to run her own animal shelter in the future. Food is nice BUT service quite lousy! Found a strand of hair in e wasabi and the Indian chap/supervisor just took it away and replaced with another plate of wasabi WITHOUT any apology at all! Was utterly DISAPPOINTED! I tried this on hari raya haji. And it was the worst dining experience of my life. The wagyu was fried (who dafuq fries wagyu?). The beef was stale (evident from it a smell and taste after biting into the meat). The oil was reused multiple times (the Chou you smell hits you hard the moment they bring it to your table). It was so bad, we all felt sick after eating it. 2 of us rushed to the toilet to puke it out, and 1 felt sick all the way home, and puked it out. This is one establishment I will never revisit as long as I live.